SeeMax is the ultimate custom made single vision lens. SeeMax incorporates Nikon unrivalled expertise in optical system to create a lens that delivers unsurpassed visual performance across the entire surface of the lens. Distortions on the periphery are reduced significantly. Precision technology honed and fine-tuned for generations in the production of cameras and high-precision measuring instrumentation lenses has made Nikon the unrivalled master craftsman when it comes to the art of making optical surfaces. Double asphericity is not a new concept. It offers improved optical performance over conventional aspheric lenses for astigmatic prescriptions. However,Nikon Seemax brings double aspheric techology to a new level. SeeMax incorporates an extra 6 aspherical axes into the back of the lens, allowing optical performance to be maximized at every gaze angle. Conventional Aspheric Lenses have an aspheric design on the front surface only.The lens is flatter, and oblique astigmatism and power error are better controlled than in spherical lenses.However when the presciption includes a cylinder, the design can only optimally control aberrations in one of the 2 principal meridians. Conventional Double Aspheric Lenses have an aspheric axis on the front and 2 aspherical axes on the back surface. This allows for a level of improvement over aspheric lenses, yet distortion still exist in some areas of the lens. 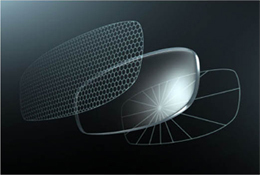 SeeMax is a multi-directional double-aspheric lens.An extra 6 aspherical axes are incorporated into the back of the lens to optimise optical performance across the entire lens surface, thus reducing aberration in multiple meridians.